This Perry Ellis luggage set of cases is sleek and streamlined, constructed with an incredibly lightweight aluminum frame and made of dobby nylon, which will hold up to all the punishment of being tossed about during your travels. The navy weave look is sleek and professional, but there is form and function as well. The trolley handle pops up with the push of a button, and the four spinner wheels give you 360 degrees of control. The interiors of each case are fully lined, while the exteriors come with two accessible outside pockets for convenience and extra storage space. None of this space comes at the expensive of style however; these Perry Ellis bags make a statement about who you are and what a pro you are when it comes to travel choices. And, if you need that extra edge of a personal bag for under your seat, Perry Ellis has a fantastic Men’s Access 9-Pocket Rolling Tote. Don’t let the streamline navy professional look fool you; these two Perry Ellis luggage have room for a great many things, so you can travel in comfort and style. The larger of the two is 29 inches tall; the smaller is 21 inches. The smaller case is a shoe-in for those tight quarters in the flight compartments above your seat, and the larger of the two, while still holding enough clothing to meet your needs easily for a week or more, is still compact enough to fit into those smaller confines which rental cars often challenge our patience with during so many of our travel moments. Both pieces have an expandable zipper which adds two more inches of space when your wardrobe cup runneth over, so to speak. One great way to put this to use is to pack the case without the expander on your way out, and then use that extra space on your way back home for all the items you picked up during your trip. Inside the lined interiors are garment tie downs as well as a zipper pocket beneath the lid, to keep all of the contents organized nice and neat. On the outside of both cases are two zippered pockets on the front, for added storage and convenient accessibility for hand held devices, medications, and other items which you will want to keep close at hand during flights.  Unfortunately, this suitcase does not feature a clip-in toiletry kit; one great option for women is the Ellis James Toiletry Bag with Hanging Hook, and we think it would pair perfectly with almost any Perry Ellis luggage set. 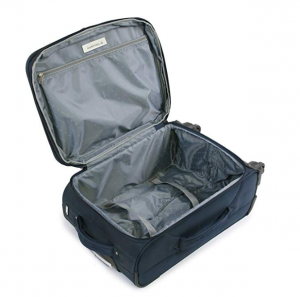 These Perry Ellis luggage are made with an ultra-lightweight frame, so that any of the national and international airline weight restrictions will not prohibit you from bringing along the clothes and accessories you need. They are constructed of dobby nylon, known for its durability, which is a much higher-quality option than other cases made of polyester or canvas. And the multidirectional 360-degree spinner wheels provide a versatility of motion which will be an asset in any busy airport when you are running and gunning to make your connection. 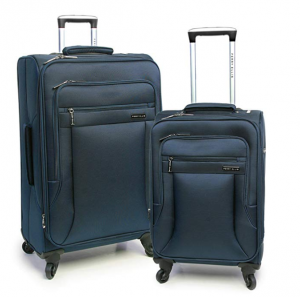 Perry Ellis luggage sets feature a look that clean with uncluttered lines yet a classy and classic design. This set will be an added asset for any look, adding to your appeal and sense of style. Other expanding lightweight bags are just not up to scratch durability wise, even though they do offer just as much space, such as Lucas Luggage’s Ultra Lightweight Softside 24-inch Expandable Suitcase with Spinner Wheels. Watching the weight of what you pack is now a constant concern for travelers, especially now that so many airlines have limited the weight of checked baggage to 50 pounds. Lugging about a heavy suitcase as you go from airport to shuttle to train to rented mini is also enough to wear out the most agile of travelers. The Perry Ellis Fortune set is an asset during all of these moments, as it is constructed of an ultra-lightweight aluminum frame. Aluminum makes a more durable case with fabulous strength to weight ratio and a more structurally sound case which can hold up through the wear and tear of travel. 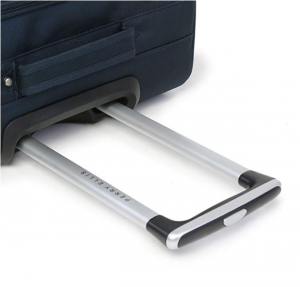 This type of frame also protects the contents of your luggage, keeping your personal belongings safe and sound, while not weighing you down so that you wonder if you brought the kitchen sink with you after all. With some lightweight suitcases, you have to give up durability in order to get a case on the lighter side. With the Perry Ellis luggage sets, this is not so. The aluminum in the frame makes them very sound structurally, while the nylon exterior resists abrasion and endures many a hard knock without splitting or giving way. The nylon is also water resistant, and that will come in handy in many an instant when the weather does not always cooperate with your travel plans. 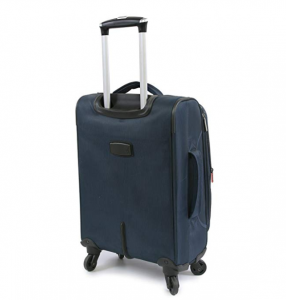 In-set skate wheels are considered more durable than these attached to the frame, so you may have a slight compromise in how the wheels hold up, which is often the trade-off for the ease in maneuvering which these suitcases offer. 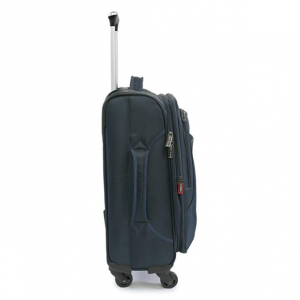 Perry Ellis luggage is a timeless style for the modern man and woman, and this baggage is no exception. The exterior is a tight woven nylon, which navy styling comes across as a clean professional look. Everything is solidly-made and easy to work, with nothing extraneous or shouting of over-kill. 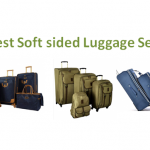 There are no obtrusive bobbles hanging down to get caught as you go through security; just a classy set of luggage which makes any traveler feel confident as they head out the door. 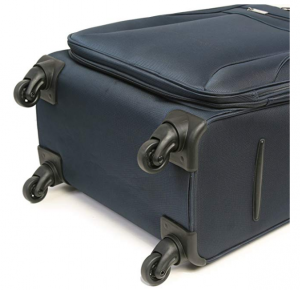 The exterior of the largest suitcase measures 29 x 18.5 x 12.5 and it is 60 inches long. It weighs 12 pounds 11 ounces. The carry-on measures 21 x 12 x 8. Each one expands two extra inches wide when you use the zippered expansion pouch. They are the perfect combination for travel, using the larger-sized one as your checked bag, which is ample enough to hold a week’s worth of clothing but small enough to guarantee you will not go over your airlines weight limit, and using the smaller one as your carry-on, as it holds a good amount of things but will still perfectly conform to the restrictions of your airline’s overhead compartment. This Perry Ellis luggage set comes with a three-year limited warranty. This is a worldwide guarantee which includes coverage on all manufacturing defects up to three years from your original purchase. Any personal misuse or neglect, of course, is not considered covered, and will result in the warranty not being applied. Be certain to include your dated receipt with any warranty requests. Warranty verifications can also be discussed with your distributor, so long as you’re buying from a trusted seller connected to the Perry Ellis brand. Perry Ellis will not except warranties on suitcases which have been purchased from a non-affiliated vendor, and therefore you won’t receive the repairs or replacements that you’d otherwise get. 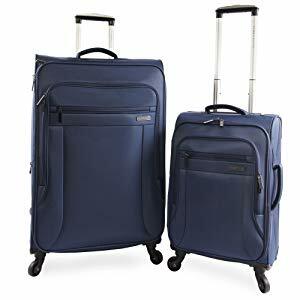 The Perry Ellis Two-Piece Fortune Lightweight Luggage Set in Navy is a stylish, versatile, and handy luggage choice for both business and leisure travel. It is incredibly lightweight yet durable, it is innovatively designed for easy use, and it has a sleek and stylish contemporary look to it which will compliment any travel situation. Its high-quality nylon fabric gives both these cases the durability to withstand the wear and tear of travel, without weighing the travelers down or wearing them out. And one of the great assets of this style of baggage, it can compliment any man or woman, its design is a great contemporary for any traveler. Ultra Lightweight in-line skate wheels. Expansion Zippers for up to 15% more packing space. Spinner wheels are not as sturdy as in-line skate wheels.